While no one can predict the future with certainty, this much is clear: the future of corporate real estate (CRE) won’t look anything like its past. We live in a world that is more globally connected than ever before, changing more rapidly than ever before, and constantly disrupted by technological innovation. It is replete with both risks and opportunities. These and other major trends are transforming how, where and when global business is conducted. 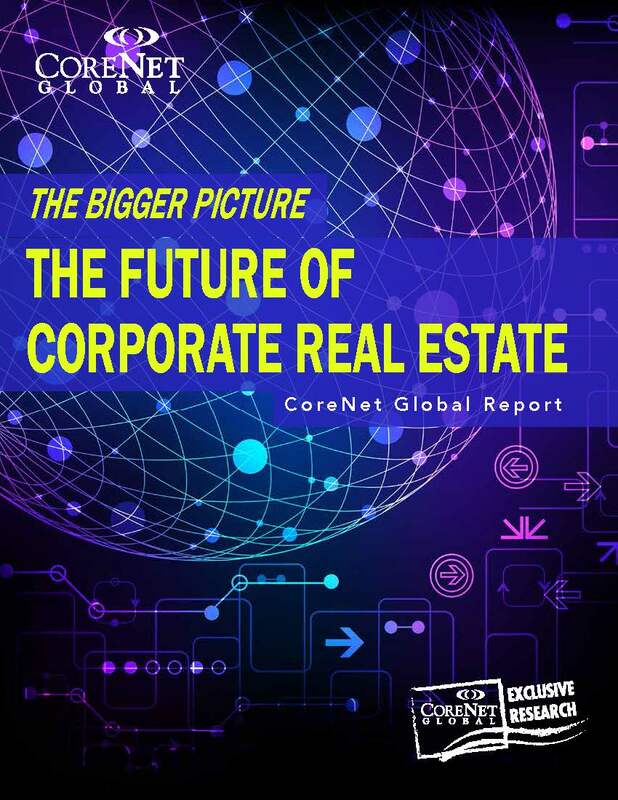 Now, more than ever, it is crucial that corporate real estate (CRE) professionals become not only students of the business, but students of the world and how it is changing. This is the purpose of this report: to place the future of CRE in the context of the bigger picture. For example, a recent report by McKinsey points out that digital flows, while a relatively new phenomenon, now have a larger impact on Gross Domestic Product (GDP) than the trade in goods. This new reality means that CRE executives need to be aware of how this will influence their function, not only in regard to the real estate portfolio, but also in terms of attendant cyber security risks presented by today’s sophisticated building management systems. Technology is also impacting how cities are run, how they develop, and what kinds of talent and organizations they attract. Smart solutions for infrastructure challenges will be increasingly demanded from city planners and managers, and will become a key differentiator between cities. Urbanism is on the rise, and companies are increasingly drawn to growing cities in pursuit of young talent. Risk management is not a new concept for CRE, but it is growing in importance and impacts the entire breadth of the CRE function. Country risks and physical security, climate change and its impact, weapons of mass destruction, and the water crisis in many countries and regions are the top risks that experts and decision makers are most concerned about, according to a risk assessment report by the World Economic Forum. Considering that location strategy is a key competency for many CRE organizations, attaining a greater understanding of what risks lie where is imperative in order to site new facilities, as well as adequately secure existing operations. This will also provide CRE professionals greater insights regarding potential threats to their company’s supply chain and enable them to contribute to strategic conversations about business continuity planning. play in this, particularly as it relates to workplace design and helping deliver a quality workplace experience for employees. Additionally, the so-called “gig” economy (driven by an increasingly contingent work force composed of freelancers, temporary cont ract workers and independent contractors) is expected to make a powerful impact on how organizations are structured, how they function and how they are staffed. How will these changes impact the need for workspace? How will they impact what kind of spaces are made available and where? These are the questions that the CRE executive will have to consider – and answer. Sustainability and corporate social responsibility are now firmly embedded in the policies and objectives of many leading corporations, with numerous implications for CRE that go far beyond ‘green’ buildings. been possible without the collaboration, cooperation, and participation of the following Partners: CBRE, Deloitte, ISS, JLL, Newmark Grubb Knight Frank, Sodexo, and Steelcase. Our sincere thanks and gratitude goes to each of these companies, who gave us their advice, including suggestions for subject matter experts to be interviewed, guidance on what questions would be most pertinent, and generously gave of their time to support this project.